rec. 2016, St Jude´s-on-the Hill, Hampstead, London, UK. Rachel Podger with Brecon Baroque can count numerous excellent releases on the Channel Classics label, including Vivaldi’s L’Estro Armonico (review) and more recently Bach’s The Art of Fugue (review) with many of the same musicians as this collection of sonatas. The concept for this recording is shared to a certain extent by the Chandos album Maestro Corelli’s Violins (review), in which the composers represented had also been employed as members of one of Corelli’s orchestras in 1708. In the case of Grandissima Gravita we are invited by Mark Seow to imagine these four composers as “they dominate the corner of heaven reserved for a very specific type of musician: the violinist-composer.” In the discourse that follows, each composer name-drops the likes of Corelli and Bach, amusingly informing us of some of the background to each character, and though there is some information on the music interwoven there is more anecdote than dry facts from which students might have been able to draw for their essays. Superbly performed and recorded as you would expect, this is a very fine collection of some intriguing and entertaining works. Bringing out the best of four musicians, the sound created is full and colourful, from sparkling harpsichord, thrumming lute and support for the bass line from the cello, Rachel Podger’s virtuoso violin has plenty of substance over which it can sing and declaim with joyous expressiveness. As the booklet ‘tall tale’ suggests, the interconnected nature of European music was in full flow during the 18th century, so you can have some fun trying to pick out Germanic and Italianate flavours; enjoy, as do the musicians here, making hay with rustic folksy charm in some movements, or have a good mourn with the sighing minor-key adagios that open Veracini’s Op. 2 No. 5 and Pisendel’s Sonata in C minor, which enjoys suspenseful dissonances and enharmonic transformations over pedal-tones. This is all high quality stuff, and packed with verve and variety. Highlights include the piquant Capriccio cromatico in Veracini’s Sonata No. 12. In the same work, the Adagio, Ciaconna that follows is the longest movement on the whole disc by some way, perhaps emulating Purcell’s ‘When I am laid in Earth’ in its opening minutes, and then after a brief inversion of those descending harmonies taking us to a rousing conclusion in its dance-like chaconne. 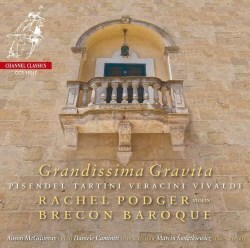 Fans of Rachel Podger and her trusty colleagues will know what to expect from this recording and need no encouragement from me in acquiring it, and others can follow their example, safe in the knowledge that this is some of the best Baroque period music making currently available on this particular planet.